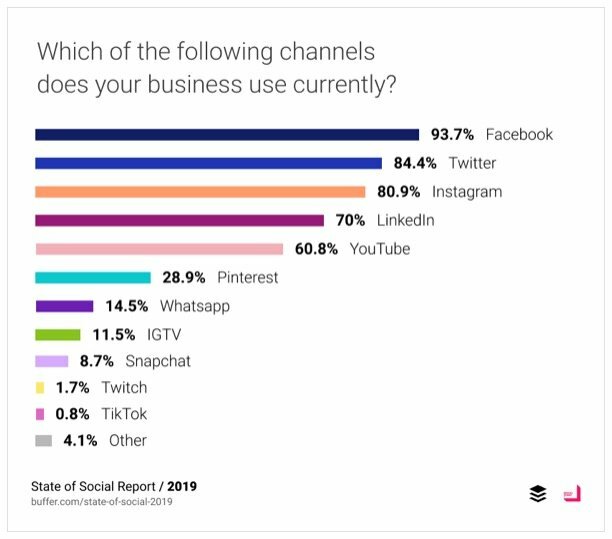 Nearly 2,000 marketers of businesses of all sizes responded to create the State of Social report by Buffer and Social Chain. The report itself is worth a read, but I was most interested in are the charts shared towards the end – the data points Buffer didn’t analyze. 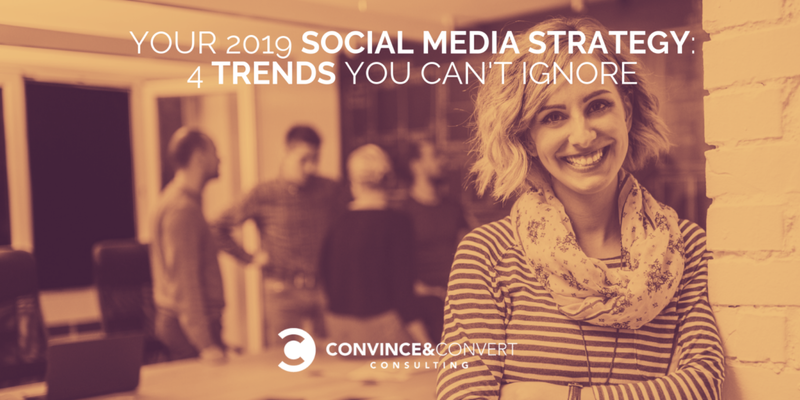 There are 4 social media trends that deserve a second look, plus some context to understand their meaning for your consideration in 2019. Social Media Trend #1: More businesses use Twitter than every other social channel not named Facebook. The social media channels that executives know about (and therefore want to see business accounts for) are Facebook, Twitter and Instagram. A second tier of channels is specialty platforms, which are LinkedIn & YouTube (and Pinterest, maybe). These are not useful to everyone, but could be impactful with a correct approach. You might have an account, or think it would be worthwhile to have one, on IGTV, Snapchat and WhatsApp (if you had any idea what content work or audiences to reach). And then there are Twitch and TikTok, which you’re keeping an eye on, mostly because your teenager is on them non stop. Old habits die hard, which can be used to explain why businesses are still omnipresent on Facebook and Twitter. These are the legacy platforms of social media marketing. The claims of Twitter’s demise started to ring as Instagram’s popularity took off, but the end of the tweet is not in our sights. That’s not to say that Twitter hasn’t had trouble along the way. Yet underneath the trolls and bots, there remains an active, vibrant community. Twitter users in the US are more likely to be urban, educated, and higher-income. We go to Twitter when something is happening – breaking news, live sports, events, TV premieres and political debates. It’s the top online source for real-time content. We also go to Twitter to share our experience with a brand or service – often to complain or to ask for assistance from the very brand or service itself. Twitter works exceptionally well for these personalized interactions, so I struggle to understand how most of our Twitter feeds are still RSS feeds in disguise. Marketers could – and should – use Twitter to connect directly with key audiences. Social Media Trend #2: Half of business marketers are still making up social media plans on the fly. Over half of marketers admitted they do not have a documented social media strategy. They are caught in the cycle of publish and pray. Reactionary social media marketing is not a strategy. Neither is creating an editorial calendar two weeks in advance, and echoing the same content across every branded account, without regard to the audiences there. What’s worse: 100% of businesses that are doing on-the-fly social media are at risk for losing any semblance of their plan, not to mention their institutional knowledge and decision makers if key social contributors leave the company, or can’t get to work. 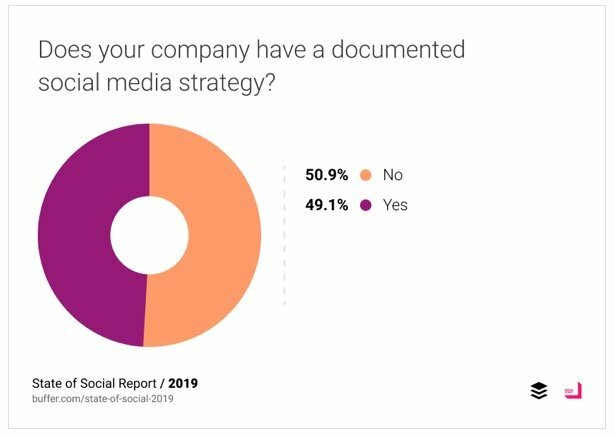 In our view as consultants to the world’s most interesting brands, more and more companies are coming to us asking for a documented social media strategy with a roadmap they can implement. Even though these companies have established social accounts with a decent audience size, and are sharing and boosting content regularly, they are embarking on their very first strategic plan for using social media marketing. The transformations that can happen when you start thinking about social media with purpose and desired outcomes are worthwhile. Unsure of how to start? Try auditing your recent social media posts, and those of 2-3 competitors. Social Media Trend #3: Engagement metrics are most meaningful for content performance. Don’t take this chart at face value. The question is worded in a way that marketers cannot indicate a preference in which engagements are most meaningful. Case in point: 2/3 of marketers say that likes, comments and shares are the engagement metrics they value the most. Not only are these answers vague, but they are meaningless. Not all interactions in social media are created equal. Pizza eaters will understand – pepperoni is the most popular pizza topping, yet it also appears on lists of least-favorite toppings. We all assign different values to things, even when we share appreciation for them. A Facebook comment could be more (or less) valuable for a marketer than a share on LinkedIn. It depends on the goals anchoring a social media strategy and what outcomes are being worked towards. 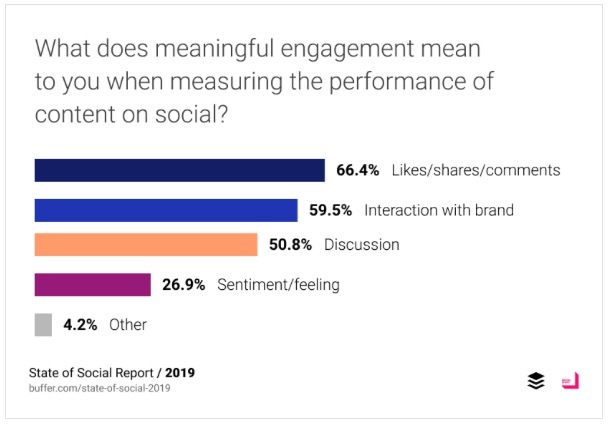 What marketers define as meaningful engagement in this response seems to emphasize the vanity metrics (i.e. : likes, shares, comments) that appear on a weekly or monthly social media report. But you can’t use engagements to fund payroll. Social media has to do more than make your reporting look good. The second most popular answer, “an interaction with the brand”, is meaningful. Bingo. Get your audience interested, intrigued, or inspired enough to have an interaction – which can become a conversation if your brand is equally active and willing to engage. Social Media Trend #4: Over half of marketers are not planning to increase the use of social features to drive direct purchases. Marketers have to get better at social commerce. Social media has tremendous influence over the research and interaction stages of any customer journey. We discover new products because the people we follow are posting about them. My local Facebook group is full of posts asking for recommendations on landscapers and handymen. 30% of consumers say they would make purchases through Pinterest, Instagram, Twitter or Snapchat. Yet over half of marketers say they are not planning to increase the use of social features to drive direct purchases this year. Let’s look at why a plan for social commerce is important. Consider that younger generations are more prone to impulse buys. Buy buttons and shoppable tags decrease customer friction. Shoppable posts increase marketers’ ability to attribute social media touchpoints in the customer journey. Forget swipe left and right; audiences are getting in the habit of swiping up to purchase in Snapchat and Instagram. In Messenger, WhatsApp and WeChat, brands are turning to chatbots to personalize an automated checkout experience for customers. Multi-level funnels are being reduced to two steps: discovery and purchase. It’s time to understand the options each social network offers to drive sales, and to start experimenting with features like shoppable tags and AI-powered checkout. 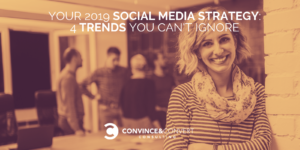 These are the four charts that caught my attention when reading the State of Social 2019 report. Be sure to read Buffer’s analysis of the key trends they identified. Check it out here.